Gavin- you will remain in our hearts forever! Last month Gavin’s father, Chris Rupp, had to make sense of a collection of unfathomable phrases. The doctors were telling them there was another tumor. It was at the center of Gavin’s brain. The surgery risk was too high. There were no options. “The doctors and our team at Children’s National kind of told us it was time to start moving to hospice,” Chris Rupp said. Chris needed to tell his 13-year-old all of this. The Rupps of Ashburn have had too many bad days. Friday was a good day. TheNationals invited Gavin to throw out the first pitch before the team played the San Diego Padres. Late in the afternoon, at around 5:15, they were hanging out together in the Nationals dugout, Gavin’s parents and his siblings, Abby and Ian. Gavin’s favorite player came walking out. “You guys want to go out on the field?” Bryce Harper asked. The group stood off to the side as the Padres started taking batting practice. An hour later, up until about 45 minutes to first pitch, Harper was still there talking to Gavin and his family. Kyle Mann, the Nationals coordinator of community relations, had never seen a player spend so much time with a kid before a game. 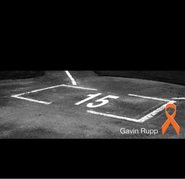 The Nationals knew Gavin’s story because the Rupps had become involved in Kyle’s Kamp, a foundation that raises money to support Children’s National for pediatric cancer research. One way Kyle’s Kamp raises money is a series of youth baseball tournaments. Local teams raise money to play, and because the Nationals sponsor Kyle’s Kamp, the final two games are played at Nationals Park. This year, the tournament raised $370,000. On May 19, Gavin’s team played at Nationals Park. Gavin pitched the first inning, went 2 for 3 and scored the first run. It was the last game he played. After the recent diagnosis, Kyle’s Kamp founder Rob Hahne called Mann. Mann invited the Rupps to come to a game. He told Gavin could throw out the first pitch, and maybe he could meet his favorite player. When Mann asked Harper if he could meet Gavin, Harper did not hesitate. On the field, he gave Gavin the hat off his head and signed it for him. After a while, Gavin sat down in the air-conditioned tunnel between the dugout and clubhouse. Harper asked questions to draw Gavin out. Gavin sat in a folding chair in the Nationals dugout. Harper leaned forward and his elbow on his left knee so his eyes would be at the same level as Gavin’s. The conversation meandered from topic to topic. They talked about Harper’s pregame routine. Gavin asked Harper about his favorite ballpark to play in, his most memorable home run, his hardest pitcher to hit off of. Gavin loves Ohio State football, and Harper’s girlfriend just transferred there, and they talked about that. They talked about Las Vegas, Harper’s home town. Harper’s father grew up rooting for the Reds, and Gavin likes them almost as much as the Nationals, and they talked about that. Harper traded one of his wristbands for one of Gavin’s neon wristbands. Harper asked Gavin to sign a baseball for him. They hung out for an hour. Harper eventually had to prepare for the game. The Nationals upgraded the family’s tickets to the suites behind home plate and invited them to come back next year. A few minutes before 7, Gavin walked on the field to throw out the first pitch. His dad had warned him against throwing from the mound, that maybe he would not be strong enough to throw 60 feet, 6 inches. Gavin stood on the rubber. 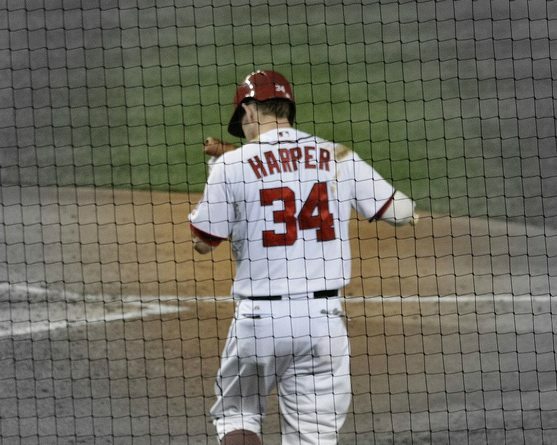 Behind home plate, Harper crouched and caught the pitch in the air. Chris Rupp stood on the dirt by the Nationals dugout, holding up a camera. For more information about Kyle’s Kamp or to make a donation, click this link. Dear Gavin . . . I didn't even know you, buddy. And there are so many young children who have fought this disease. A number that is unbearable. So why is it you, Gavin, who has pierced my now broken heart? Is it because I'm a mom of three boys? A mom of three baseball players? A mom of two who have been mine for fourteen and twelve years - bookends to your thirteen? Is it just that I am a woman who considered her faith strong and yet found that each time she saw your face on the computer screen, her eyes blurred and spilled tears, all the while looking up and questioning God? We waited for the miracle and we prayed so very fervently for it. I saw you in my mind and felt you in my heart, a prayer for you and your family on my lips countless times a day. And as soon as the prayer for the miracle floated up to Him, in the very next breath I asked Him to help us if the miracle we wanted didn't come. I begged Him to never let go of your parents, of your sister and brother, of your friends and of those, like me, who never had the privilege to meet you. I asked Him to please not let the anger and sorrow take over and break our faith today. I asked Him to let us wake up on this morning with that faith upright, strong, steady and firm. I asked Him to help us believe that even on this day when it is absolutely unfathomable to our human minds, that there just might be a miracle here somewhere in the midst of dust so thick with pain that we are blind to see it. Because I know that I have been told that God will make beautiful things out of the dust. And I gotta say, if I was your mother and someone told me today that there was reason, purpose, beauty to come out ofthis? Honestly, I just might scratch someone's eyes out. This? This sorrow, this tragedy, this confusion? Thisis too dark. Still I make myself go to my Bible and read the words in black and white right in front of me: faith is the assurance of things hoped for and a conviction in things unseen. And since I prayed for eyes to see, I better keep searching for a long, long time for what beauty might come out of these ashes. And the thing is Gavin, that even though I am blinded today, there are a few things that I know for sure about this summer. My summers are always full of baseball, and this one was, too, but it was oh, so very different. It was a summer, that because of you, I spent countless moments talking to God while I sat in the bleachers, not only about hits, strikes, and diving catches, but about courage, compassion and awareness. It was a summer, that because of you, as I watched my sons grip baseball bats or slide into bases, I gave thanks, not only for their successes, but for their fingers and their hair and their little noses and their every breathing moment. It is the summer that because of you, I left unironed clothes in a wrinkled mess in the laundry basket and sat down with my 8 year old to watch that show with that annoying, talking dog whose voice gives me an eye twitch. It is the summer that because of you, I lay in bed with them and read aloud even though they all know how to read on their own. It is the summer that because of you, I ran farther and farther, each mile bargaining with God . . . if I do one extra mile, maybe the miracle could come? Even though I knew much better, I still played the game and I ran a bit farther because of you. It is the summer that because of you, little boys so singularly focused on base hits and strike outs and wins, found that though they were little they could do big things with big love that eclipsed just a number on a scoreboard. It is the summer that I had the honor to speak to your dad and to marvel that he could even put one foot in front of the other, much less demonstrate an astounding strength that I will never forget. I was able to see that his eyes shown with purpose - a purpose beyond his own pain. It is the summer that because of you, whenever I see the color orange, whether it be my child's flaming orange hair, the burning flicker of a candle, the bursting glow of the sunset or even the neon orange of a traffic cone, I will forever see your face and send up a prayer for your family. It is the summer that because of you, I have decided to work very hard to keep my faith tethered to me even in spite of the inexplicable, crushing loss of a boy so very much like my own three. This morning, on this day, the test of a faith begins and I'm not sure I am equipped for it, but I know in the very deepest part of me that He is equipped. I know that my faith will remain, not because of my strength and my will to hold on, but because our God is too strong, too powerful and too faithful to let me go. And right about now, on this morning, I'm pretty sure you know that very well, huh, kiddo? So Gavin, though I never met you, I will never ever forget you. I will never, ever stop praying for your family and friends and for all the children who will follow you into battle against cancer. Because of you, I will not allow my life to remain unchanged. I will try to remember that this summer, a small boy's life brought extraordinary lessons and also brought little changes in the life of this ordinary woman. Little changes that might just add up to beautiful things in a life unfinished. And I know that I won't be perfect. I will become impatient and will not be grateful enough and I will let mundane annoyances get to me. But because of you, I am hopeful, that on the days when I feel like everything is ash and dust, I will look hard for beauty. When I feel like I am ash and dust, I will try hard to be beauty. I will try very, very hard to be beautiful . . . to be beautiful, like you. Rest in peace, Gavin. You will be forever loved.